What's your Gala Theme for your next Gala event? 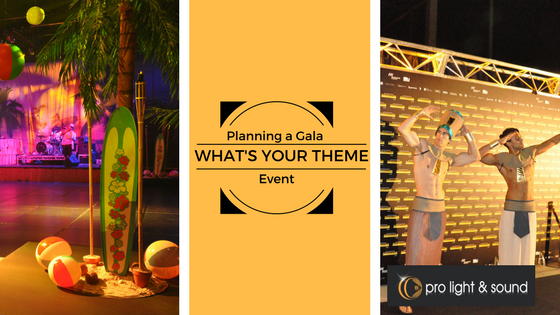 Why choose a Gala theme? Giving your gala a theme can really help to take it to the next level, as well as make it much easier to plan. There are so many tiny details you have to consider when planning a large event and having to choose what kind of tablecloths or centrepieces you want from a seemingly never-ending list, or how to decorate the walls of a cavernous venue can be an absolute nightmare. Having a theme can help to make these decisions easier. It narrows your decor options and will make sure that you end up with an event space in which everything – from the dancefloor to the dishes – complements each other. Though we love a good ‘Under the Sea’ party as much as the next person, many forget that an event’s theme doesn’t have to be cheesy or complicated. It can be as simple as a colour scheme or specific pattern. Take ‘Black and White’, for example. Classic and elegant, this theme is extremely easy to execute and will give your gala a sense of unity and professionalism. At Pro Light & Sound, we offer a whole range of event lighting and decor options to help you create the perfect ‘Black and White’ event. Whether you want decadent drapes (in satin, chiffon or patterned velvet), classy chandeliers, or a sleek and shiny dance floor, we’ve got you covered. If you want to base your event’s decor around a specific pattern, we can also help you out. One of the best visual services we offer are our show-stopping themed pattern projections. These lights have the potential to make any dull event space look interesting and lively. Consider pairing them with patterned tablecloths or a patterned centrepiece and amaze your guests. And, if you’re thinking about planning a Hollywood-themed shindig, we are also experienced creators of spectacular VIP entrances. You’ll be able to literally give your guests the red-carpet (or black-carpet, or custom-carpet, depending on which carpet you choose) treatment, ushering them into an event they’ll never forget! You also have the option of adding poles and ropes, and even an iconic media wall, to really make everyone in attendance feel like a movie starlet or Hollywood heart-throb. Whatever theme you choose, Pro Light & Sound should be your #1 audiovisual equipment consultants.